Penn and Teller: Fool Us. 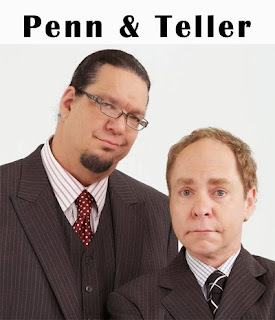 Penn & Teller are an amazing “dynamic duo” in magic. As professional magicians and entertainers they have surprised and dazzled thousands of audiences through the years, becoming increasingly familiar in the field of magic and illusions. One of the most well known and popular TV magic shows is “Penn and Teller: Fool Us,” presented by Jonathan Ross. Penn & Teller: Fool Us The program has received a lot of great reviews and critiques(*). For me I think the program encourages magicians, it doesn’t matter the level, to come to present magic trick routines. The concept of the program is to do something to fool two expert magicians and entertainers, to be clever and smart enough that Penn and Teller can’t guess or figure out the secret. But does fooling Penn and Teller make someone a good magician? After years of studying card-trick and stage show techniques, mixed with theater studies, philosophy and other arts-related fields, I found myself with many questions, mainly this one: what type of work did I want to do with magic? In the middle of this “crisis,” I was very blessed to meet the great Fantasio (RIP), a magician and professional with deep knowledge about magic and the field of magic. With lots of magic theories and techniques in my head, I asked him that day many years ago in Miami for advice about which direction I should take in order to make my living and build my life around my passion for magic. Fantasio responded to my question with a simple one of his own: Do you want to work for magicians or for a general audience? My reaction at first was – what? I was not expecting that type of answer/question. After a long conversation, Fantasio made me realize that there are two types of magicians: Those who perform for other magicians, and those who entertain a general audience. Many of the magicians who come on TV to fool Penn and Teller are fantastic. If magicians decide they want to make a profession in magic entertaining general audiences, they must master techniques as well as a host of other talents. They - Magicians - must be great entertainers, sometimes comedians or musicians or actors, playing the best role of a stage magician. Magicians also have to be great marketers and business people to find the right niche and promotion for their magic shows. Whatever aspiring magicians decide they want to do – perform tricks for magicians or entertain general audiences – there is great potential for a career in the business. The life of a professional magician is a beautiful thing – as long as you know your audience and prepare for it, so that in the end you’re not the one to be fooled.